Stefanie Taylor had her first experience playing in an orchestra when she was 13. Taylor attended a two-week summer camp in Poultney, led by the Vermont Symphony Orchestra. She played violin among some of the best players in the Northeast. “When you’re sitting in the middle of an orchestra playing, the sound, the vibrations that go through your body—it’s kind of indescribable,” she said. Taylor knew then that she wanted to pursue music forever. Taylor, who grew up in Clarendon, skipped seventh grade and graduated from high school a semester early. “I was eager to move on and focus on what I was really passionate about,” she said. She was 17 when she started college in Indiana. She then pursued a master’s degree in music performance in Long Island. Taylor,now 50, is back where she started, pursuing a childhood dream. She is one of the principal players in the Vermont Symphony Orchestra. 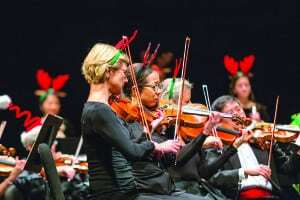 This weekend, she’ll be leading the string players in the VSO Holiday Pops Concert in Rutland. Taylor is one of seven viola players in the VSO. If her colleagues have questions about the notes or nuances in a piece, Taylor is in charge. Music was a strong part of Taylor’s upbringing. Unlike most children her age, Taylor preferred classical music. Taylor remembers first seeing violin players at the Rutland Unitarian Universalist Church when she was 4 years old. Taylor started taking violin lessons from a local teacher at age 7. She later learned to play the viola, an instrument similar to the violin that’s slightly larger. The viola produces a deeper, more melodic sound than the violin. After college, Taylor played soundbites for movies and commercials in New York City. Her recordings appeared in ads for companies and organizations like Fruit of the Loom and the Republican National Convention. Taylor often played in the orchestra for Broadway performances of the Lion King. She was even a substitute player for The New York Philharmonic. “I learned so much living in New York and listening to so many people play,” she said. Taylor moved back home to be closer to family in 2009. She knew instantly that she wanted to be part of the VSO. Taylor won a regular spot as assistant principal after a successful audition in 2012. “Vermont Symphony has been a constant part of my Vermont music life,” she said. Now, Taylor is playing side by side with some of those people she met at summer camp as a teenager. VSO’s second bassoonist, Becky Eldredge, 68, who has been part of the VSO for 31 years, remembers Taylor’s passion for music at the summer camp. Eldredge was on the activities committee at the camp, in charge of running games in the afternoon. “She was a wonderful player,” Eldredge said.Eldredge now sits behind Taylor in the orchestra. “She’s a good leader,” said Eldredge, who lives in western Massachusetts. Taylor still lives in Clarendon. She teaches music in Middlebury while her four children, who range in age from 13 to 22, also play string instruments. Taylor is the only member of the VSO who lives in Rutland County. She’s eager to play for her home crowd this weekend. The holiday performance will be held at the Paramount Theatre at 3 p.m. Dec. 16. The VSO’s 100-member chorus will sing and stand-up comedian Hillary Boone will take the stage in between songs. Taylor said she often knows several people in the audience at the Rutland concert. Clarendon local Stefanie Taylor, center, will lead the viola players in the Vermont Symphony Orchestra in a holiday concert at the Paramount Theatre this Sunday, Dec. 16.